UPDATE: Glenfiddich's brand manager points out that the 50ml miniature used in the following review is quite old and that the flavor profile has changed. I have performed a follow-up review. Archetypes often come in pairs; good/bad; male/female, etc... Yesterday's post recalled Macallan 12 as the sherried archetype of good single malt from my earliest experiences with single malts. Glenfiddich was the bad. As a self-identified beginner I had been steered to a 3 cornered green bottle of no-age-specified Glenfiddich. It had been paler than straw and of a weak insipid character with chalky and sour notes that added years to my journey by inspiring distrust and suspicion. When this was overcome I never returned to Glenfiddich. Once I was gifted another bottle of the no-age-specified stuff and it was the first scotch I ever regifted unopened. Glenfiddich Special Reserve 12 40% abv. Late 1990s dusty mini. Nose: Sweet with heather, gorse, a touch of the flinty mineral taste I recalled - but bracing when better integrated into the mix. There are also some vanilla floral notes that are fresh and appealing. Entry is sweet and very light. The mouthfeel is ethereally light. There is sweet cereal malt and a grassy meadow note at mid-palate. Then things start to go south. The cereal flavor turns a bit sour towards the finish. It's like I'm tasting an echo of underfinished wort. There's not enough oak to check it (or the oak is too tired). The finish concludes on a sour and chalky note very reminiscent of the primary flavor of the old entry level Glenfiddich (that almost made a white liquor drinker of me). The entry and midpalate of this 12 year stuff is honeyed and way better than that undated material - but the finish is unpleasant and in the same way. To be fair, with extensive time the honeyed aspect begins to tame the sour aspect - but it's too little too late in my book. It's a walk down memory lane in the wrong neighborhood. Why this stuff is recommended to newbies I can't understand. It must drive droves away from malt whiskey. It reminds me of the cheap department store telescopes that so many children are given which are impossible to use well and thus turn them off to astronomy. If you need a light and simple scotch, choose a sweet and clean one like the young expressions of Glenfarclas, Glenmorangie, Glengarioch, Macallan fine oak, or a good blend like White Horse, Teacher's Highland Cream, Famous Grouse 12, Douglas XO, Johnny Walker Green, or Gold. Thanks Josh, you may have saved me from wasting some money, and wasting a few evenings where I could drink something good instead! I've yet to try this, but some part of me feels like I ought to just because this is like THE standard entry-level malt. I feel like I skipped a grade in my malt education, but maybe there's nothing worth learning in that grade... I kindof guessed that it might be the way you describe, but no one seems to call it like that in their reviews. Glad you did. BTW, not sure if you've had Glenfiddich 15, but DO NOT be scared to try the 15 just because the 12 (and under) isn't any good. Glenfiddich 15 is quite good. Thanks for the tip about the 15. I'll keep an open mind about it if it comes my way. Who knows, maybe you would like the 12 too? Glenfiddich is one of the top 3 so lots of folks must like it a lot. Perhaps my issue is a personal idiosyncrasy - like your thing with Glenmorangie. But I don't think so. I think Glenfiddich is well marketed - beyond the quality of the product (like McDonalds). I concur. Glenfiddich 12 is around $40 here too. This price point is jam packed with awesome competition. There's no compelling reason to put up with a dram with a sour and metallic finish that mars an otherwise decent light and honeyed floral entry. The old no-age version was called "Glenfiddich Pure Malt Special Reserve" - FYI. First up - I work for Glenfiddich as a Brand Ambassador in the UK. Just so there's no thoughts of "hidden agendas" here. I have to say a thank you to you Joshua for doing the one thing that many people never do - open your mind and go back and try something again. I don't mind that you still prefer other malts, and I respect the fact that you at least gave it a try. So thank you. Ryan suggests you should try the 15, and you should. But you should also seek out another sample of the 12yo. Why? Because the miniature in your picture was bottled (I'd guess) around 5-10 years ago. The label has changed at least twice since then (check our website for the current labelling, so you know what you're looking for) and the whisky itself has been on a gradual journey since that no-age-statement bottle you remember so vividly. So, please continue to keep an open mind and see if you can find a bar or an off-licence stocking the current Glenfiddich 12yo. I look forward to reading your review when you do. Jamie, thanks for stopping by and I appreciate your extremely gracious tone - particularly in light of the unusually strident tone of my review. My blog is just beginning. It's quite striking to me that it has captured your notice at all. It makes me recognize the responsibilities inherent in public writing. To that end, thank you for pointing out that my sample was old. The label is indeed different as you point out - so it clearly predates the current design. I purchased it at a very small local shop (that may be a good place to find other "dusties". Sometimes old bottles can be desirable). I'll look for a current sample with the current label. 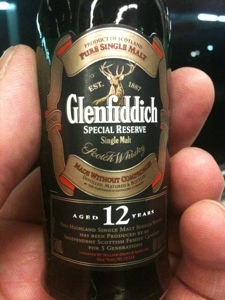 Alternately I may request that my friend pour me more from his recently opened bottle of Glenfiddich 12. As I reported, my impressions were that it was good (although I had had a few at that time). In the interests of fairness I certainly owe Glenfiddich that much. I certainly will accept your suggestion I try other expressions as well. There have been good reviews and it's time I get back to the sweeter Highland and Speyside expressions. Thanks for dropping by and look for my follow-up in the weeks to come. Unfortunately for me, this was my first foray into Scotch. I hated it so much I thought "All scotch must taste terrible!" and it was quite a few years before I saw the light. Yes, exactly my experience. If, as Mr. Milne says, Glenfiddich has improved its flavor profile in recent years - one can still express some outrage that it wasn't so wonderful in previous years - in light of the fact that the base level Glenfiddich expression functions as a nearly universal gateway to single malts in general. As a brand ambassador for whisky in general, my hope is that people's introduction to single malt Scotch is a sweet and lovely dram. Perhaps Glenfiddich's base expression over the recent years. However, that it was not so during my introduction and yours is a shame. I have a 3 cornered bottle of Glenfiddich, labelled Special Old Reserve...given to me in 1974-5 by my father. It is unopened and still foil sealed with completely intact label. I am not a spirit drinker but feel it is a bit special. Any ideas/views on this item? I own a 3 sided bottle of Social Old Reserve given to me by my fathering 1974-5. It is unopened and sealed and kept in a cool cupboard. Any. Views or thoughts about it.